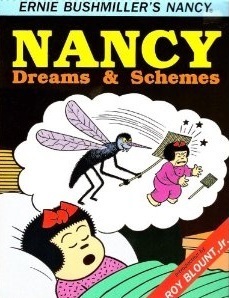 I was never a big comic reader as a kid, but beyond "Peanuts", Nancy and Sluggo were my absolute favourites! Nothing like their manic lifestyles and ridiculous fantasies. Ernie Bushmiller - Ernest Paul "Ernie" Bushmiller, Jr. (1905 - 1982) was an American cartoonist, best known for creating the long-running daily comic strip Nancy. Bushmiller's work has been repeatedly addressed by other artists: Andy Warhol made a 1961 painting based on "Nancy"; the artist and poet Joe Brainard made numerous works based on Nancy; and many cartoonists have produced work directly inspired by or commenting on Bushmiller's art, including Art Spiegelman, Bill Griffith, Mark Newgarden and Chris Ware. The American Heritage Dictionary uses a Bushmiller "Nancy" strip to illustrate its entry on "comic strip."